Chiropractic Medicine Lexington: How Much Do You Know About Chiropractic's Origins? Healing comes from many different sources. Sometimes a medicine will come from a natural source and then be synthesized into a Western medicine. Other times the body can simply take care of itself and doesn’t need any additional treatment, like when you bump your arm and get a bruise. In the most extreme circumstances, a doctor will have to perform surgery in order to set the body straight. Chiropractic is yet another source of care that has been discovered and proliferated around the world. While our chiropractic clinic offers many different types of alternative medicine that are both traditional (such as massage therapy) and state of the art (cold laser therapy and cryotherapy), today we’re going to focus on the core of our business: physical adjustments. Chiropractic is a form of alternative medicine. It is primarily focused on manipulating the spine in order to treat problems associated with the musculoskeletal system. Some chiropractors believe that its primary usefulness is limited to the skeleton and related system. Others believe that regular chiropractic adjustments can positively affect the entirety of the body, treating anything from diseases to allergies. Chiropractic is formed from two Greek words: hand and practical. To most ears it sounds like chiropractic should always be an adjective, such as in the phrases chiropractic care of chiropractic medicine. But chiropractic is a noun by itself, so saying “we practice chiropractic” is perfectly accurate. Chiropractic is a relatively new form of alternative medicine, especially when you consider that Eastern practices like acupuncture have been around for thousands of years. 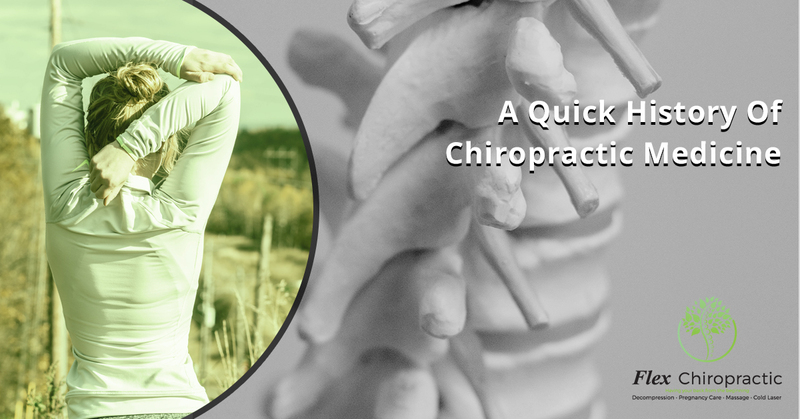 But chiropractic is neither ancient or foreign; it began in Davenport, Iowa in 1895. Daniel David Palmer, also known as D.D., was wary of the traditional medical community. (Considering it was the end of the 19th century, we don’t blame him!) A man named Harvey Lillard told Palmer that he had suffered from severely-reduced hearing for nearly two decades, and that the reduction in hearing had been accompanied by a pop in his back. Palmer, having heard of alternative medicine such as osteopathy and bone setting, gave Lillard a spinal manipulation. Days later Lillard described his hearing as being nearly back to normal. Both D.D. and his son Bartlett Joshua Palmer were both religious men who were convinced that the revelations of chiropractic had been revealed in order to better align the life force that represents God’s presence in man. He believed that subluxation, or the misalignment of the spine, was the cause of all human diseases. For a few years D.D. Palmer kept his study of chiropractic within the family. But when he noticed the good it was doing for them, he decided to take on some students and open the Palmer School of Chiropractic. This was the first school of chiropractic in the world. One of D.D.’s students was his son, Bartlett Joshua (B.J.). B.J. was convinced that chiropractic was an excellent alternative to the medicine of the time. Eight years after the school opened, B.J. took over and expanded enrollment. Many of the chiropractic schools of today were founded by graduates of the Palmer School of Chiropractic. For over a century there has been contention between the American Medical Association and practitioners of chiropractic. D.D. Palmer himself was jailed for practicing medicine without a license. Over the course of around 60 years, chiropractors have won the right in all fifty states to secure licensing that is separate from traditional doctors. In today’s world there is still a divide in the chiropractic community. While some adhere to its mystical roots, the majority of chiropractors have extensive medical training and many are doctors. Most use a variety of equipment in order to assist, such as drop tables and decompression equipment. A chiropractic clinic isn’t just a place to get the spine adjusted; it’s a place to get a wide variety of alternative medicine treatments. Visit Us At Flex Chiropractic! Flex Chiropractic can be found in both Columbia and Lexington, offering you a wide variety of treatments that can help you feel better. Whether you’re in need of traditional subluxation or a more specialized treatment like decompression, ultrasound, electrical stimulation, cryotherapy, or cold laser therapy (or a combination of any of them), we can provide you with the best in alternative therapy. We look forward to hearing from you! © 2018 Flex Chiropractic. Do Not Copy.